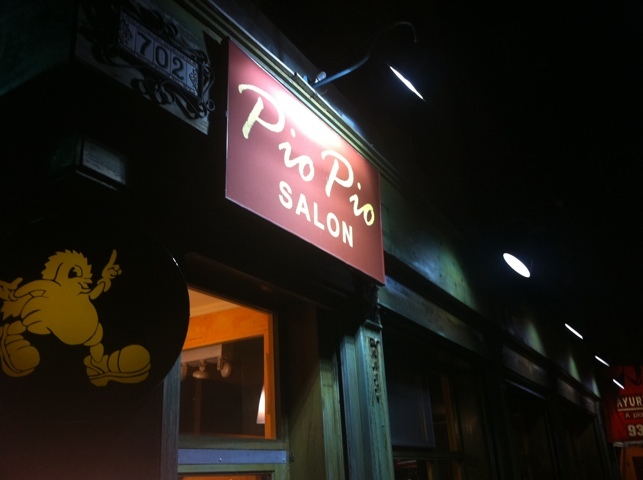 There’s a Pio Pio Salon on the Upper West Side, which is part of the small chain of Pio Pio joints. I had been there once before, and recalled having a fantastic, festive time. It had been quite a while, and the missus hadn’t ever been there. Reckoning we’d do something a bit different, we gave it a run. Inside, the band getting set to play. I have to say I was struck with a slight twinge of anxiety almost immediately upon walking in. Why? I saw a microphone and sound equipment set up, and while the place has some space, it seemed hard for me to believe it was large enough to have whatever music that was about to be playing not be oppressive. But more on that later. As far as decor goes, it’s a dark sort of place that seems like it is caught between what it is and what it wants to be. At first glance it seems sort of dark and perhaps classy but that image fades fast when you look closer. There’s white paper atop the white tablecloth on the table, and I quickly found out why: the place (despite aspirations to be more) is essentially a chicken shack. 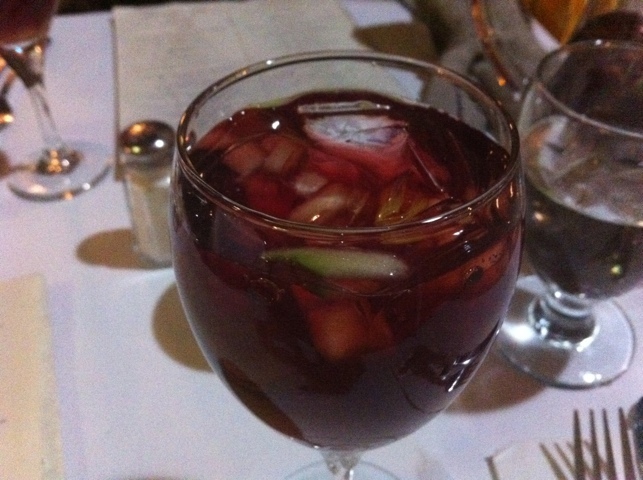 We started out with some sangria, which was very very sweet. Almost like a soda in its intensity of sweetness. While the waiter did encourage us to try something other than the chicken, if you look at the menu, it just doesn’t make much sense to try anything else. 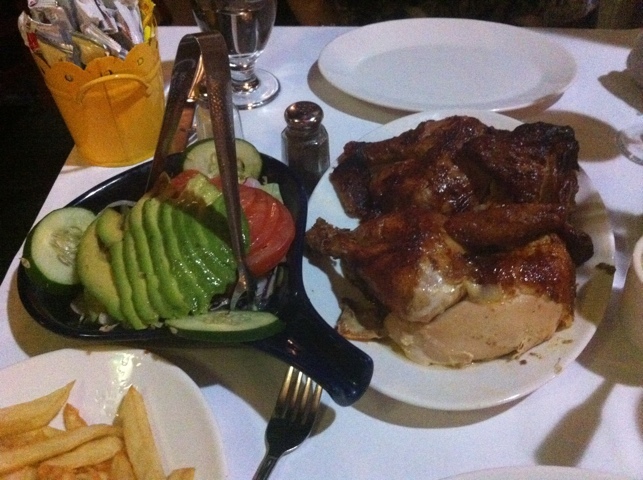 I mean, the Peruvian Combo – a whole chicken with avocado and fries – is $26. That’s an ample amount of food for two people. Other individual plates – like the Lomo Saltado (beef saute with peppers and onions) are $18 and up. Why would someone spend double when you can get a whole meal for two for $26? So, like I say, the menu drives you toward the chicken, especially if you’re cost-conscious. It was at about this time my fears about the microphone were realized: Peruvian pipe music. My wife and I both were rolling our eyes. Look, it’s nice and everything, but what is it about Peruvian pipe music? 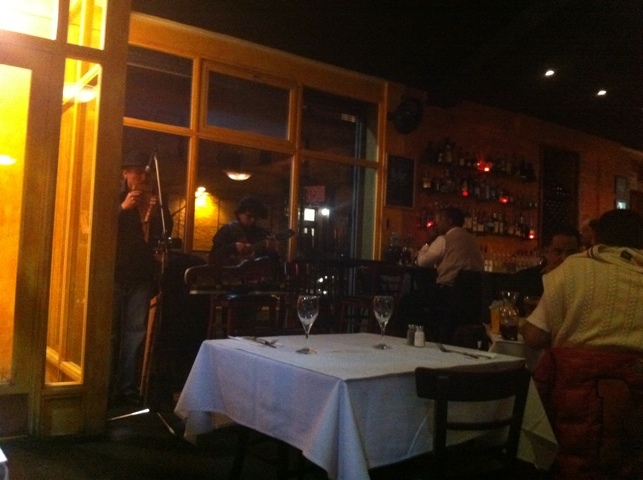 It is both universally appealing and ubiquitous – seems like any major tourist attraction in the world has a Peruvian band at it – but we were not enjoying it (and the synth drum track) with our dinner. As my wife pointed out, it made it seem like we could’ve been eating in the subway anywhere in the world. Well, at least it kept us drinking. The Peruvian Combo. Quite a bit of food. So along came the meal, and it looked pretty promising. As you can see, it’s a whole pollo a la brasa (marinated rotisserie chicken). It looked pretty choice. But I was a little surprised. The chicken. 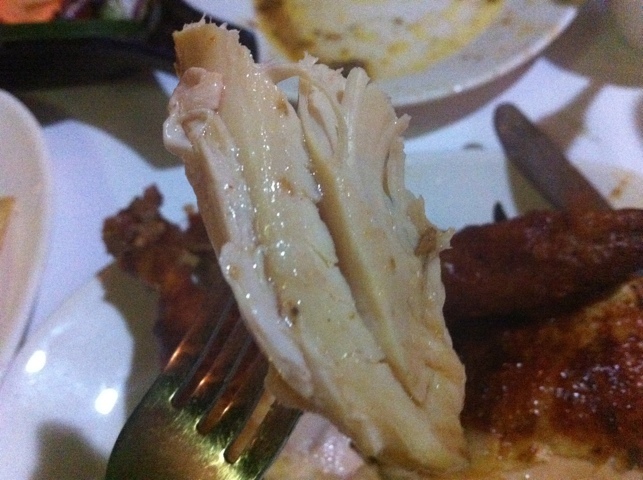 Juicy, but not super tender, oddly. The chicken was tasty (the skin the most flavorful part, where you could perhaps pick up a lime note amid the salty, fat flavor). The Peruvian spices and flavor were basically engaging, though the chicken was not quite as tender as I expected. The whole thing made me have a serious craving for that Costa Rican specialty Salsa Lizano. Not quite Salsa Lizano, but... . They must’ve known about this issue because they serve it with a green sauce themselves. The sauce added chilies and an effervescence, helping to wake up the chicken. Let’s face it: chicken tastes like chicken, and this preparation while making it fine didn’t make it (in my opinion) particularly special. 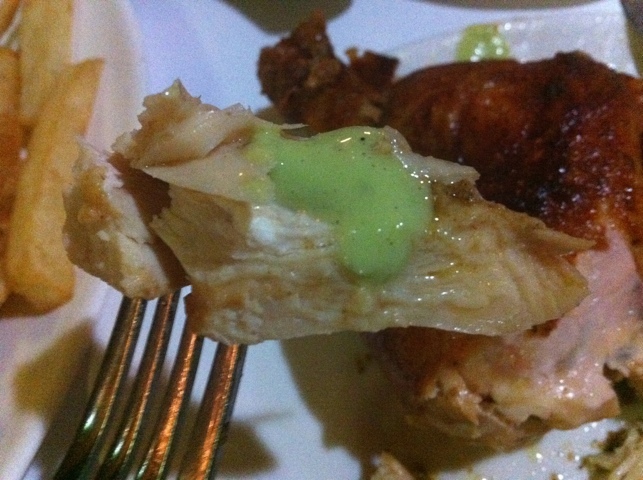 Frankly I think I prefer the pollo a la brasa at Flor De Mayo. The salad wasn’t particularly interesting, it was refrigerated and generally meh. 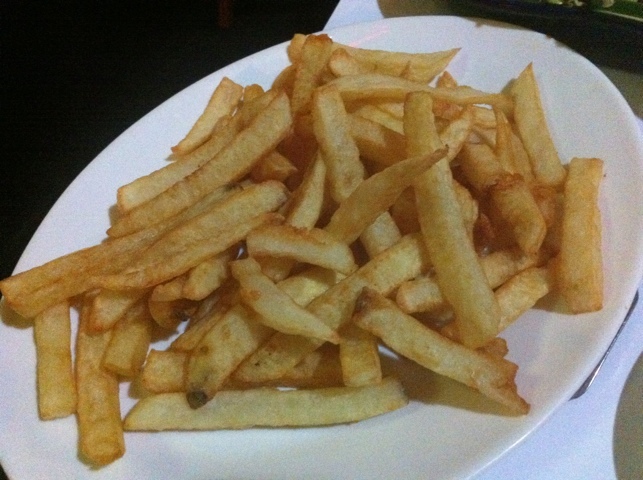 The fries were good and hearty, surprisingly crispy too. They had a faint pepper note. Brilliantly, they offer a wet nap at the end of the meal, which was needed for sure. The whole meal clocked in at $52 – $26 for the chicken for two and $26 for the pitcher of sangria. All in all it was too much food and we took some to go. I’m not going to knock Pio Pio. The chicken was tasty, and the bang for the buck is certainly impressive. But it didn’t especially wow me, and the Peruvian pan/synth music was a bit much for me. I may go again, but won’t especially miss it if I don’t.